The City Observed by Pallavi Shrivastava reads like dispatches from a battlefront by a seasoned war correspondent. Each chapter is a stimulating vignette of some memorable place, or recently contrived artifact, through which Pallavi unravels counter intuitive conclusions. Pallavi has two eyes and many voices. Those two eyes see things often unnoticed, bringing into focus a collage of real life issues and human circumstances. She has an uncanny ability to conceive of the metropolis as an everyday person would, yet to catalyze unique understandings and conclusions from her choreographies! She navigates the metropolis building narratives out of keen insights, speaking for those without voices; giving eyes to people who have eyes, but no vision. Pallavi’s most provocative ability is to reveal contradictions between the emerging urban form and the critical needs of the everyday Mumbaikar, who emerges forgotten in the unfolding scenario. Her written landscapes reveal disturbing images of the bad within the good, and of poverty within plenty. From bright images emerge a sense of charm, tinged by nostalgia for the city’s past, yet a warning of pathos in times to come. “Mumbai, as it has been unfolding, rising so to speak both physically and metaphorically. And in doing so, has somewhat undone itself. Now, nothing seems absolute” – from the opening notes of ‘The city observed, Notes from an unfolding India’. The book revels as a brimming collage of tangible and intangible threads embedded in layers of encounters to make for a surprising cohesive commentary on complexities of Mumbai’s built environment. 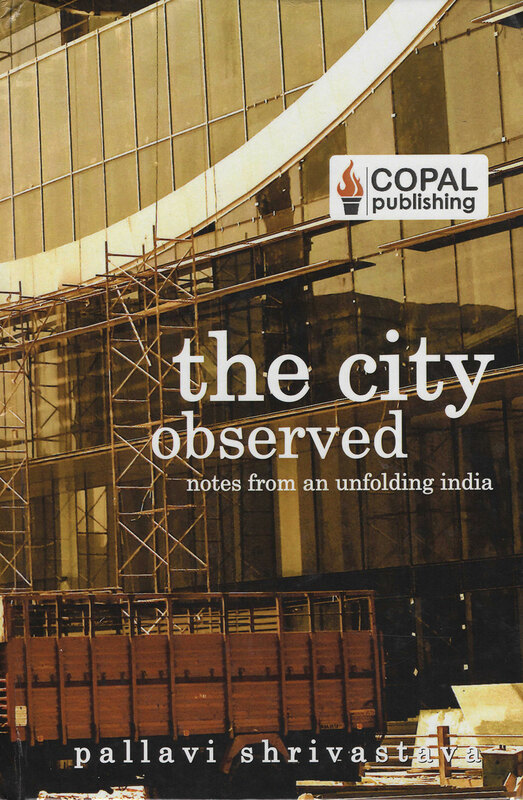 A compilation of vignettes – essays, notes, and dialogues – structured principally around Pallavi Shrivastava’s undertakings as an architecture and design critic, ‘The city observed’ delves into the broader relationship and engagement with complex ideas that form the city, its fabric and in instances, the practice of architecture in her purview. “Reading through her essays on events, current or continuing, I have sensed a quiet resolve regarding topics both complex and difficult, some of the contention, others deserving of it, some yet to find aim; but all fundamentally tied to the specific context of India, the city within which she resides, and the forces of culture and society that shape them both,” says Kevin Mark Low in the Foreword. Scan of a double spread from the book. The book opens to an introspective premise set by a collective of meaningful quotes. The cadence of the essays included is by no means extensive or exhaustive. Composed in seven sets of readings, they come across as selective illustrations of potential issues that could be further explored in relation to each theme. Pallavi has documented the unattached and even little-noticed nuances of everyday life, while simultaneously offering fluid subjective interpretations. 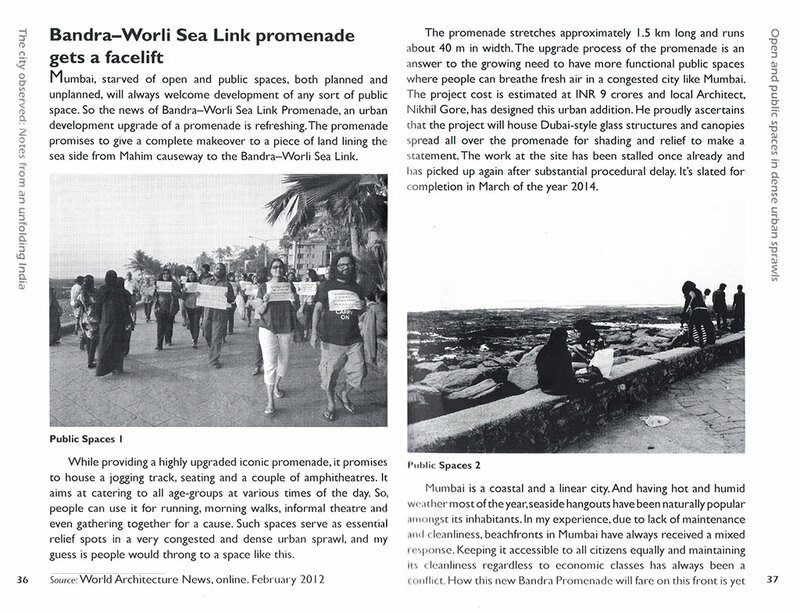 The groupings are topical and concern themselves with ‘Social Fabric and forces for the built environment’; ‘Mumbai’s built environment, books and beyond’; ‘Urban planning/design and outcome in infrastructure’; ‘Open and public spaces in dense urban sprawls’; ‘Review of old and new buildings and interior spaces’; ‘Local architecture events on built environment’ and ‘In-depth interview with architects’. 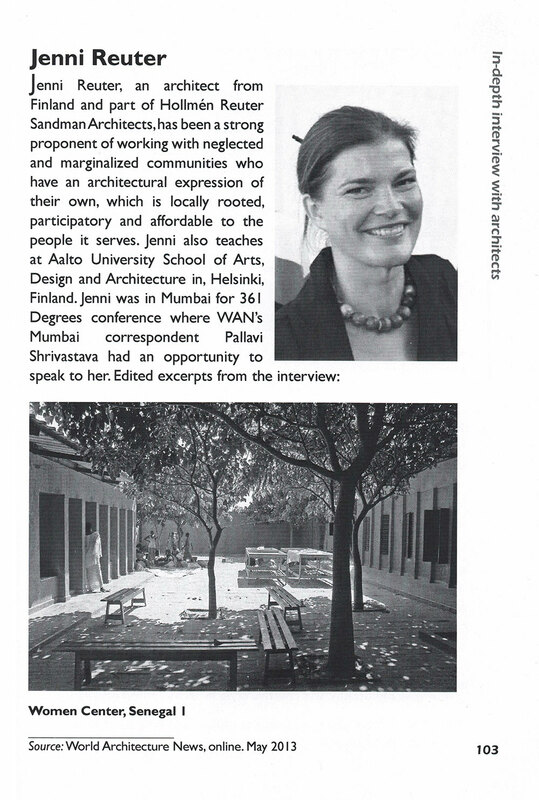 Scan from the book: Interview with Jenni Reuter. Each black-and-white page is written in a spirited and informative prose, sporadically supported by the requisite visuals. An essential quality of the book is that as a liberal record of an abundance of reflections and deliberations, it offers the reader the occasion of distinct encounters with a motley of ideas. Unlike a traditional polarised approach, one follows a kaleidoscopic shift of emotions and concerns. However, the questions that emerge are neither trivial nor limited to the narrative at hand. The book has its roots in reality.